Every business has its own unique set of reporting needs -- from determining which keywords drive the most website traffic to understanding the top performing mobile search ads over time. Having a consolidated, and comprehensive view of how your account is doing helps you spend less time creating reports, and more time identifying new opportunities. That's why over the next several weeks, we’re rolling out dashboards: a single place in AdWords* where you can bring together your most important reports and unearth insights about your business. Dashboards gives you the flexibility to arrange your tables and charts in a way that’s most meaningful to you. You can add existing saved tables and charts to your dashboard, or create new ones on the spot. Curious about how your campaigns performed last summer? As you can see in the image above, you can quickly select any date range to see how your dashboard looked during that period. You no longer have to navigate back and forth across different tabs and reports to get a comprehensive view of account performance. Instead, you now have all your important tables and charts in one place. You can easily see your impressions and CTRs by device right next to clicks by device as shown in the image above. This helps you to better understand the relationships between your data, and easily identify patterns and trends. There’s always a performance improvement opportunity waiting to be discovered, and dashboards allows you to quickly identify them and take action. If you work with multiple people on the same AdWords account, you can now build and review dashboards together. All dashboards in an account are conveniently listed in the Reports tab for seamless collaboration. To help get you started, we’ve provided a starter dashboard as an example of what’s possible. You can choose to build off of this dashboard, modify it to your needs, or delete it and create your own. 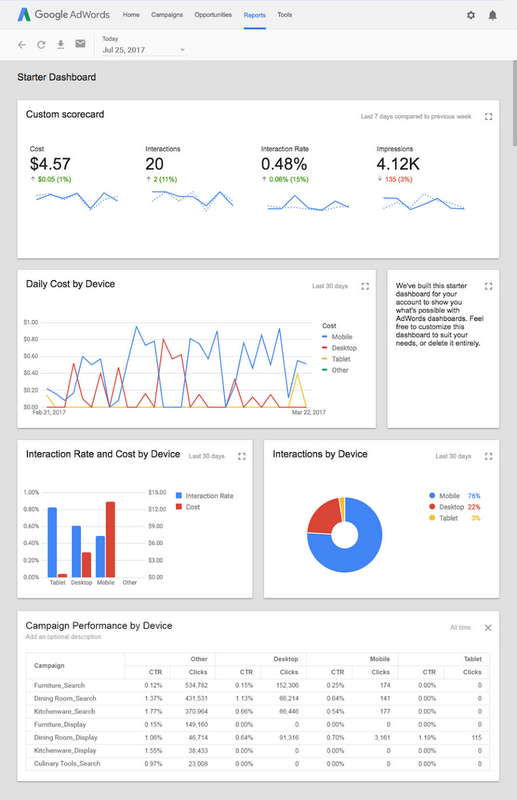 Creating dashboards in AdWords is simple. Just click Reports at the top of your account, click the Dashboards tab, and then + Dashboard. To create your first dashboard, take our guided tour. 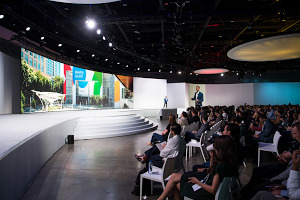 You can also learn more about dashboards in the AdWords Help Center. *Dasbhoards are available in both the previous and new AdWords experience.